I visited Hiroshima again for Setouchi International Yacht Rally. The port status is same with 2007 status below. When your boat approaches the marina, it will be hard to find the port entrance because of overlapped walls of breakwaters. Just follow the arrow sign to enter. 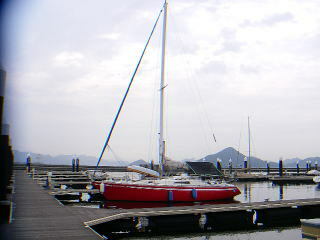 In the marina, the top of the visitor berths poles are painted in red. If there is additional open space, the marina staff will show you. When I called the marina office, a staff came to take my dock line. I’ve heard this marina is inconvenient though, it is easy to be with the frequent bus services. Water and Power at the pontoon. Fuel berth, hoisting crane and factory services are available in the marina. Toilets and Shower rooms are available. Good restaurants are next door. An Italian restaurant was crowded with local people. For food and coin laundry, take commercial frequent bus services. A big supermarket is 7 minutes bus ride away. 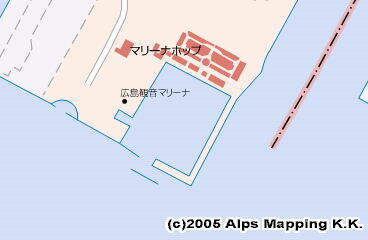 Hiroshima Kanon Marina is located at the south end of Hiroshima City. From the downtown Hiroshima City, the marina is just a half an hour bus ride away. With over one million population, Hiroshima City is the capital of Hiroshima Pref.